How do I create a pie menu item that toggles between these two tool settings? ts = C.scene.tool_settings; L.operator("pme.exec", text="Cursor" if ts.transform_pivot_point == 'CURSOR' else "Box", icon='PIVOT_CURSOR' if ts.transform_pivot_point == 'CURSOR' else 'PIVOT_BOUNDBOX').cmd = "ts = C.scene.tool_settings; ts.transform_pivot_point = 'CURSOR' if ts.transform_pivot_point != 'CURSOR' else 'BOUNDING_BOX_CENTER'"
Currently, trying to discern when to use operator vs l.prop or what not is very difficult. L.operator(...) function shows basic clickable button with customizable action. As always, thank you. Is it possible to create a hotkey toggle for Solid view studio + texture to matcap? I’m trying to build a functionality of lookdev without graphic demands of lookdev. I haven’t figured out why I can’t call the commands with macro operator. Hi, thanks. Is not about the scenne keying set. 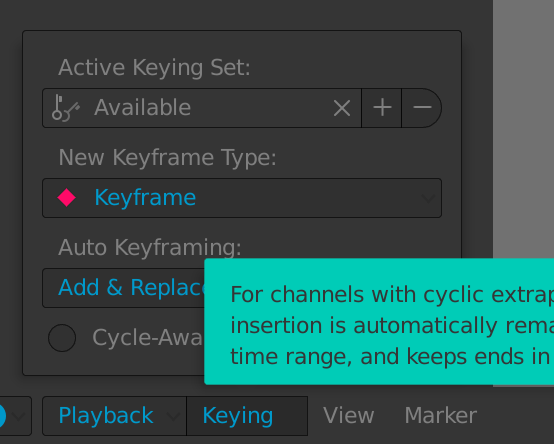 Is about the timeline keying set. the name is quite the same, but both give different options. That generate the confusion. For some reason, the timeline version, doesn’t want to appear. I added the export fbx command to my pie menu and I was wondering if there is a “simple” way in PME to add a custom command to get the active object name as default name for my fbx file. For some reason, the timeline version, doesn’t want to appear. After restart blender, some pop-menus (specifically pose menu), doesn’t works. Please export and pm me one of these pose menus. yeah I tried but as soon as I hit apply it will get the current active object. hi i was wondering how do you prevent text from being cutoff ? @roaoao, after setting up a shortcut for Duplicate (shift+D) I get an error. In this case you don’t need to hit that button. Just paste the code and click OK. Please export and pm me this menu. Thanks, will release the fix today. I exported my pie menu, added the line in the json file then imported it back and it worked! I’m using both editors right now for solving it. Yep, forgot to mention. This panel is designed for Timeline editor which should be opened somewhere in the window. I’ve managed to create this tool. But it works only in Orthographic mode. Need more time for this to support Perspective and Camera modes. When using a popover created from PME’s interactive panels mode, multiple clicks are allowed in the popover before the menu is dismissed. Is it possible to incorporate this behavior with regular Popup Dialogs that open automatically when a pie is initialized? A ‘make persistent’ mode, for example.